Can you tile onto wood? Timber floors naturally bend, bounce and expand, which can make tiling onto wood a potential nightmare. Without the right floor preparation, tiles can end up cracked, uneven and overlapping. By taking the right steps however, these potential pitfalls can be prevented, keeping the wood floor in check and the tiles in top condition. Before tiling, it’s important to ensure that the floor is stable. To stop tiles cracking or moving, the floor should support the expected load without deflecting (bending or bouncing) too much. It must also be level and well ventilated. There are two methods of preparing floors for tiling: over-boarding, or tiling directly onto the existing wood. This method involves fixing a layer of plywood board over the timber floors, in order to make the surface sturdy. This stops the tiles being disturbed as the wood underneath moves. When overboarding, the first step is to brace any areas which may need extra support by placing noggings between joists. Any damaged boards must be cut out and replaced, and existing boards must be screwed down onto joists using two screws at each end and another two wherever they cross joists. For smaller floors with no noticeable deflection, 9mm water and boil proof (WBP) plywood is recommended. 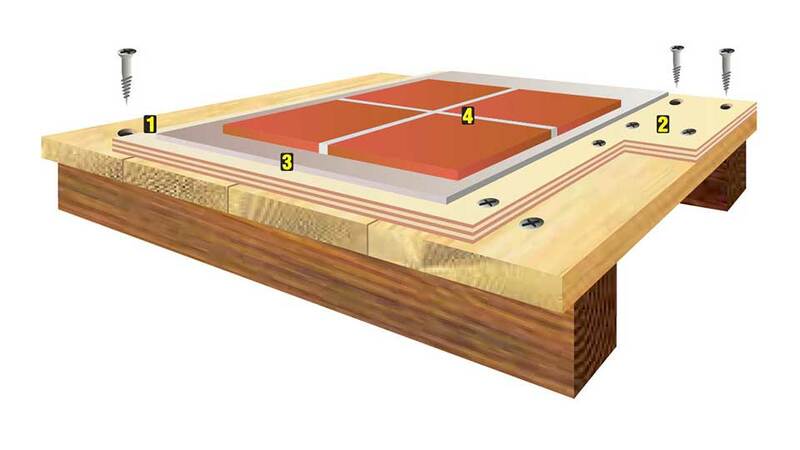 If there is some deflection, a minimum of 15mm WBP plywood, or equivalent tile backer board is required. The back and edges of the plywood should be primed using weber PR360 in order to help tiles stick later on. The plywood boards should be laid over the timber, making sure joints don’t overlap. Because plywood can expand, gaps of roughly 2mm should be left between boards, and gaps of 5mm at the edges. Screw the boards to the timber every 200-300mm using corrosion-resistant screws. The gaps between boards and around the edges should then be filled with weberjoint silicone. This should make for a far more stable floor, but another layer of board may be required if movement is still observed. If tiling onto existing boards of plywood, check that they’re fully supported by joists or noggings. Any damaged boards should be replaced, and noggings should be fitted between joists underneath any unsupported edges. Boards should be screwed to the joists or noggings every 200-300mm, and there should be a 2mm allowance for expansion. The back and edges of the plywood should be primed with weber PR360, and the gaps willed with weberjoint silicone, to prevent them getting filled with tile adhesive later on. Boards should be exterior grade, and at least 18mm thick. If the floor needs to support heavy loads, or if the joists are spaced more widely than normal however, an additional layer may be required to increase thickness and stability. Once the surface is ready, it’s time to start tiling. Tiles should be fixed into a solid bed of a flexible tile adhesive such as weberset rapid SPF, leaving joints at least 3mm wide to allow for grouting and movement. The adhesive should be at least 3mm thick for over-boarding, and 5mm thick when tiling straight onto wooden flooring – it may need to be applied to the back of the tiles in order to reach this thickness. The adhesive should be spread evenly using a notched trowel at a constant angle. The adhesive should be applied to areas of roughly 1m2 at a time, or as large an area as can be tiled within 10 minutes. Use a slight twisting motion and consistent amount of force when placing the tiles, which will help to ensure they’re stuck down firmly and evenly. The adhesive should be left to set for at least 2 hours, and then the joints filled between tiles with a water-repellent and mould-resistant tile grout such as weberjoint premium to prevent mould and staining. Finally, use a colour-matched weberjoint silicone to fill movement joints at the edges of the tiled area. Ready to start tiling? Get hold of the right products at your nearest store - you can find that here! If you have any questions, get in touch with us.